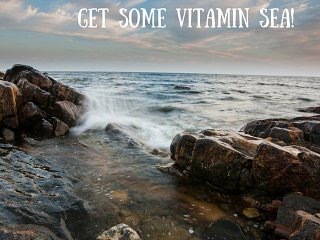 Why you need more Vitamin Sea! There’s something magical about listening to the rhythm of waves as they break on the shore, isn’t there? Sitting on a beach watching the waves and breathing in fresh sea air is top of most people’s holiday wish list – and with good reason. Better sleep: Sea air is packed with negative hydrogen ions, which helps us absorb more oxygen and reduce levels of stress hormones in our body. The repetitive, hypnotic sound of the waves is like a giant “white noise” machine helping you to fall into a deep sleep. More relaxed: Those negative ions will make your muscles relax and looking at the sea will let your mind wander. Meditation experts use the sound of the sea to help people’s minds become more peaceful. Researchers who showed images of the sea to people discovered their brains were less active – ie, more relaxed – than when they were shown photos of city centres or parks. Glowing skin: Swimming in the sea or walking along the beach is gently exfoliating, sloughing off dead skin cells and rejuvenating the skin. Go barefoot and you will gently scrub your soles, and because the sand’s harder to walk on you use up more energy too. Result. Seaweed baths: Seaweed is, unsurprisingly, full of salt and bathing in a seaweed-enriched bath allows salt to draw out toxins and beneficial trace elements and minerals to be absorbed. Go barefoot: Even if it’s round the house or in the back garden, kicking off your shoes can help give you better posture and improve circulation. Happy long weekend!